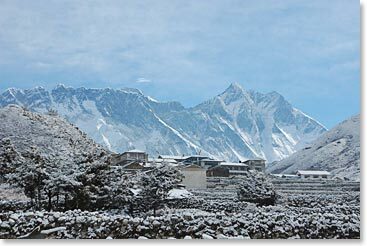 Berg Adventures is heading to Nepal for our 2013 Everest Expedition. But every journey to the top of the world begins with a trek to Base Camp. Joining our Everest Expedition Team on the trek are friends, family and Everest-enthusiasts alike. The adventure begins in Kathmandu and continues on to the Tenzing-Hillary Airport in Lukla at 9,383ft/2,860m, and it only gets more beautiful and more exciting from there! Our objective will be reaching Everest Base Camp at 17,500ft/5,334m where we plan to spend a few nights with the team so that we can experience life at camp and give the team an enthusiastic send-off. Along the way we will be surrounded by some of the world’s most famous and photogenic peaks, stay in charming tea lodges run by welcoming Sherpa hosts, and share the excitement of the expedition team as they prepare for their ascent of Mount Everest! Stay tuned for updates from our adventure in Everest’s Khumbu region of Nepal!